Bathroom soap dish allows excess water to drain right into the sink—soap won’t get mushy and lasts longer. Counter stays dry and clean, too. Plastic; 5 1/2"x3"x 5/8". I was losing my expensive soaps so fast due to them always sitting in water no matter how many times I emptied the water. this pushes the water right out leaving your soap stronger. I have one of these soap dishes in my main bathroom. Several friends have commented on the fact that they would love to have a soap dish like this. So I ordered a couple for gifts. I don't understand why there aren't more soap dishes designed like this. keeps your soap and soap dish from staying mushy between uses. I ordered these for every house and sink I've ever owned. I wish they came in more materials or colors. The white discolors after awhile. After having suction type soap holders on wall that continually fell off and soap dishes without a drain, I tried this product. It is perfect and always drains the water out. Also, there has never been mold. I love it. No more soapy mess on the sink. No dripping of the liquid soap dispenser. No pumps to go bad on the soap. Soap last longer and no clean up from it. It looks neat on my small sink in the bathroom. I just wish it had a larger tilt to it for the proper run-off. Terrific. I'd never before found a decent soap dish, to keep the soap dry and not make a mess. This one works perfectly. I can use my favorite moisturizing bar soap, and I don't have to lug home heavy liquid soaps. I bought five and use them all over the house. My hand soap was always mushy... no more. This product is just what we needed. It might not fit in a corner of the shower. Take a close look if it HAS GOT to fit there. It does not fit in the front where the soap is suppose to go in a pre formed shower/tub stall. Mine sits in the back a little crooked and still drains over fine. I have had the V shaped soap holder and it was all ways coming loose. You could not move it to clean it like you can this one. It's used in our bathroom, we like the neatness of the soap dish. No dripping into the floor or on the sink. Wanted a way to make the soap dry quickly and last longer. Not only does it do that, I bought 2 and my husband's soap stays cleaner, too. Less the mess. going to purchase another 3 for every bath!!! The item cleans well,No mess.Drips right into the tub or basin.No cons!!!! Even people who visit and use the restroom, comment on the soap dish, asking where I got it and how they can get one. This is great. I got rid of all of the other soap dishes. This one beats them all. My husband is happy because the soap dish stays in place so he does not keep knocking it on the floor. I've been looking for a soap holder where the water didn't collect and make the soap gooie. This soap dish fits the bill. excellent for the areas where I want it. Money Saver, Soap Not Soggy Any More! I have one near every faucet, saves money, keeps soap cleaner and prevents it from being soggy and therefore melting away faster. this product prevents soap melt away. Really saves me some bucks, I buy all the soap in the house (I am living with 4 collage guys) while on a serious budget so I really need ways to save the bucks. This works for me. Inexpensive smart investment, I recommend getting one for every faucet area and one for the utility sink. They are perfect just the way they are. Some folks like to decorate just about everything, so ya might want to try painting it with a plastic coat spray paint to match your decor and decorate as desired. It drains fine and the suction cup holds. I don't get mushy soap and the area stays clean. Like it alot. I use this in my bathroom. This works perfectly and keeps my counter tops clean. I had my bathroom redone and now had shelves in my shower. I saw this soap dish online. I liked that it had a suction cup and would stay put. The unexpected bonus is how much longer a bar of soap lasts. Now that water can't collect around the bar and it dries it seems to be harder and lasts weeks longer. The dish isn't real pretty but very functional. Also it needs some space so it wouldn't fit on a small sink area. But in my shower, it is just great!!!! I have been waiting my whole life (a really long time) for a soap holder like this - what a great idea! No more soap mess! No more rust! Thank you!! I have used a similar soap dish for years. This design is the BEST for saving soap and eliminating soap dish cleanup. It is necessary to wipe the sink where the soapy water drains but this is easier than cleaning a soap dish with slime in it. Also soap is NEVER slimmy. I highly, highly, highly recommend this soap dish. I know. It's only a soap dish. But it is a great soap dish. Great product for my Mom as it is hard to reach what she needs in the tub. Keeps her soap dry and the soap dish from collecting water. We all like the soap dish very much. Highly recommend. I put it in the bathroom and when i used the soap the water drained right off of it. Now i won't have a messy looking sink. I don't know why I didn't get this sooner. I love it. Does exactly what I needed it to do. Keeps my kitchen sponges high & dry! I was glad to find this in the catalog as I could not find at any stores. The soap does not get "soggy". This product takes care of the soggy -soap problem in the bathrooms. Great! For soap lovers out there this product is wonderful! It really helps to keep the soap dry so there is less of a mess and it lasts longer. I would definately recommend this product. So simple and it works so well! Our bathtub has no soap dish and the soap scum was accumulating in corner of tub. We are renting and cannot mount anything permanently in the tub. I bought two of these and have them pointing into the tub/sink so the soap scum no longer accumulates in the corner. The suction cup is nice because it secures it to the tub but you can still rotate the soap dish around. It really does keep the soap very dry and that saves soap--it has to be replaced less often. I really like this product. I use this product in the shower. My daughters use this at the sink. Either place it works great. The soap stays really dry and you can watch the water run right off into the shower. I might not place in a guest bathroom but for the shower and for my daughters bath its fine. Would recommend this soap dish to anyone looking for one that drains the water off efficently. I have one in each of our bathrooom. Now I am buying for family members, and they Love them. Have it in in the bathtub in 2 bathrooms and am thinking about getting another for the 1/2 bath. Soap stays solid - no more squishy messes !! love this as it drains shower water and allows the soap to dry. I so dislike soggy, soft soap. I've wanted this for sometime and am very pleased. I bought this product to save soap. Tired of sloppy soap bars. This product is very useful and keeps the soap bars dry. Bought as gifts for Christmas also. We bought seven of these! For my sisters and father-in-laws homes and my own. We are all happy with this product and so glad we got them. This really helps the soap form sitting in a pool of water and getting all slimy! Let's water runoff as advertised. This soap dish is wonderful! The large suction cup on the bottom sticks to any surface. The raised prongs in the dish really keep the soap in a position to not only drain out into the sink after use but keep it in a position to dry out completely. Much less messy than liquid soap - if you have been missing your bar soap - your problem is solved! No more mushy soap! A great product! BOUGHT 3 2 for home. 1 for beach house. 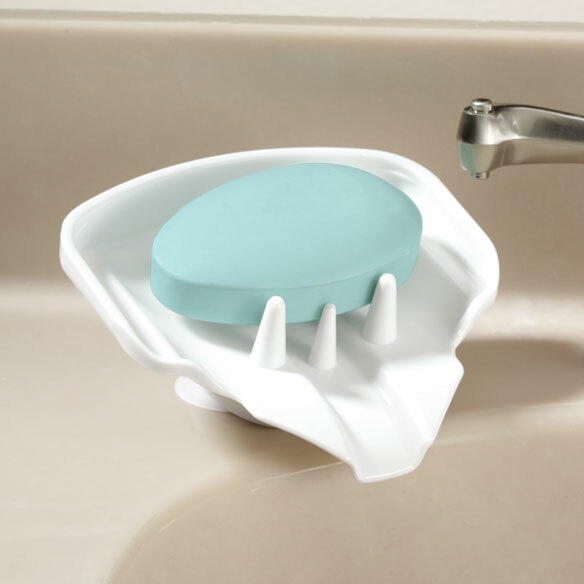 this design is VERY GOOD and perfect to keep the soap bar from getting slimmy and stuck to the dish. The liquid soap drains off and the bar is ready to use next time. Great item. This works great for keeping bar soap un-soggy! It's not very attractive (what soap holder with holes, is?) so I just have one in our master bathroom where no one but us sees it. But it works perfectly, so bars of soap last longer and there's no mess! Keeps soap bars from being mushy; and the soap lasts longer. I actually use this in my kitchen, not bathroom, for my pan scrubbies so that the water is able to drain. THE SOAP DISH IS JUST A GREAT PRODUCT! I won this soap holder in a Chinese Auction about seven years ago. It is durable, functional, easy to clean, and I absolutely love it! It still looks brand new even though it has been through 6 kids and a husband. The only downside is I wish it came in different colors. I would not trade it for any other soap dish. I have saved so much soap and it is great for kids. Am so happy I finally found a place where I can buy more! Works like a charm...keeps the soap dry. Great for use in bathroom for hand soap. Keeps soap from getting messy. Very well made...I would buy again. I have worn out several pairs, using two at a time because of two different kinds of soap in use. they last longer than the towels do. We really do not like slimy soaps. I have become a comment reader before a shop on line. this little soap dish is so great. I have a resest square to hold soap in that gets so filmy I couldn't stand using bar soaps anymore. I went to pump soaps and if you have kids your using so much more soap. because the kids just keep pumping. Since I replaced the pump soap with this little soap dish. Guess what no playing with a pump. not only that but easy to clean. Easy to suction back to sink, just great. Only soap dish you need! We love these. bought 5. The kitchen one keeps the sponge clean & dry. Very nice for keeping soap usable and keeping it from melting onto other surfaces. SAW THIS AT A FRIENDS, AND LOVED IT SO MUCH I PURCHASED TWO. I DONT KNOW IF THEIRS HAD THIS, BUT OURS CAME WITH SUCTION ON THE BOTTOM, SO IT STICKS TO THE SINK, BUT YOU CAN MOVE IT TO HAVE THE DRAINAGE PART GO RIGHT INTO THE SINK. LOVE IT. I love this gadget. It has solved a very long on going problem of sponges being left in the sink or in dirty water. This keep the sponge in it's own place and water just drips away right into the sink! Perfect and healthy. Awesome...just awesome! In every bathroom there was always a puddle of run off from the bar soap. It's messy and it's wasteful. But this is the cure! I put two in the main bathroom - one on the edge of the tub, one at the sink. One on the kitchen sink, one by the sink in the laundry room - that one may be my favorite - my husband uses that sink to wash up after working on the cars and such. The mess is gone. And I think the bars of soap last longer! I love it! Been looking all over for one of these. It has a suction cup under it that works great and it swivels, how nice is that. Ordered one to check it out, now I want more. Since we have a member that is handicapped this soap holder keeps the soap in place and not slippery to grab. Everyone knows how slick wet soap is. Well, this product is slick as ever. The soap water and residue drain right off toward the spot you point the spigot (as I call it). So far I've only had to run a little water over it once to get rid of a little soap residue. Just what I was looking for. I ordered one and after receiving it I ordered 3 more. Works great keeping soap dry. Have grand kids that usually make a mess when washing hands, this solves that problem. Love it!!! I bought 2, 1 for bathroom and other for kitchen. Its made of a heavy duty plastic that is angled for ease of water drainage, with suction cup for stability. I can't think of anything not great about it, just might suggest more colors to choose from. This solved a big problem in my house. The swimming bar of soap, usually drowning, no longer has to do the back stroke and I don't have to play clean up. It drains itself! GENIUS! No more disgusting soap residue! This is probably the best designed tilting soap dish I have been able to find. I have seen others that tilt a little, but are not at a steep enough angle to drain the water completely. The soap in the shower no longer turns into a soft, gooey blob and the soap by the sink lasts much longer. Sometimes the small soap slivers stick to the plastic, but that's a small price to pay. I bought four. I bought this soap dish for mom. She had one but it didn't have the prongs so that the soap will stay on the dish ... the soap would slide off. This does the trick. My showers have custom shelving extending into the shower area. The shelves are hard to clean. These soap dishes allow the soap residue to trickle onto the floor and get washed down the drain. I had to go to using dove bar soap for my hands because it is so mild and any other soap dish left my bar of soap a gooey mess. This is great. I bought 4 to spread through out the house. Keeps my handmade soaps dry! My mother bought several of these for her home and I loved them so much that I had to get some for each bathrooms in mine! The quality is awesome! I have this on my kitchen sink, before the soap was always messing up the sink. This works for what I wanted. It drains, and I also put my green scrubbies on it to get it to dry out. I had bought one a few years ago and loved it. My dad was visiting for a week and just thought that was the neatest soap holder so I bought him two. I would recommend this product! I've had these for about 3 years - no problems. Water drains, so saves the soap. It cleans easily and does come apart if you really want to get into the back of it. It's great. I think my bathroom soap lasts about a month longer now. IN MY BATH TUB. JUST LOVE IT. Love this item and it was at a price that any budget can afford. The item tilts in a position that lets any water or soap suds run off into the sink. Best soap dish I have ever seen or had, now i have two of them. I would buy this soap dish again. We really like the Bathroom Soap Dish. Soap Saver Soap Dish is the perfect name for it! I purchased this product because I was tired of the mess of a soap dish. The soap never lasted long in the old type dish, but this is wonderful. It keeps the soap dry in between uses and there is no mess on the sink. I have had my eye on this soap dish for some time. I'm glad I finally ordered it. The soap sat in my former soap dish, getting mushy. No more! And I expect that my soap will last longer. I'm glad that I also ordered one for my vacation home. I love this! I use a tension rod holder in my shower. This saver has a slight tilt so the soap isn't sitting in water and getting soggy. Drains nicely, easy to clean. It works just great. It has a great design & is attractivie. I love,love,love my soap dishes. This soap dish stays put. It does what it is supposed to do. It looks very nice. I even have one in my kitchen. You can't beat the price. It really does look nice. I even purchased one for my Mother and she loves hers too!! Used for soap dish. Water drains into sink rather than softening and spoiling the bar of soap. Never deal with icky soaps again, plus soaps last longer. A really good gadget. No more soap lumps from bars sitting in a puddle. I use it in the shower and the sink. works better than anticipated. priced right. looks good/any decor. allows easy removal or replacement in unit. Works great in our bathroom. Like using in my Bathroom. My husband like it. This item is a little large but if you have the right space, it works great! Keeps soap from sitting in water and getting soggy. I've had them for years and they seem to last forever. Friends want them too. They continually ask where I got them. This is great in the bathroom as well in the kitchen for sponges or scouring pads. I love that the dish sits off the counter so it will stay dry under the dish. The fact that the soap dish has a pour spout and is angled forward, water doesn't sit inside the dish either. Keeps the utility sink tidy. I've had a number of people ask me where I got it because it's so unique. Practical and useful. Worth the price. We use this product in our shower as well as in our kitchen..This soap dish makes your bar soap last much longer because it does not sit in water like a regular soap holder. The water drains off of it. It is a great product and I would reccomend it to everyone. This works amazingly well....will be ordering for family/friends!! This little gadget solved all my problems in the shower, lavatory and the kitchen sink. It is great to pick up a dry bar of soap to wash your hands...which I do very often! This dish is easy to pack to take on trips for my special body cleansing bars that I take every where I go. I love the soap dish saver. I have looked and looked for an item just like this and it is working perfectly for me so thanks!! Very practical and the sopa last longer. Fits very well in the large bathroom. No real comments. Simple product, simple design that works as described. Great product. Soap never gets soft. I used to use the type of soap holder that would collect water. If you didn't empty it your soap would get soft. Also tried the kind made from wire, but they would leave lines in the soap. This soap holder not only keeps the soap from getting soft, but the excess water runs right off of it.. I only wish it came in different colors! This item is a great item to give as a simple gift. Great to conserve soap and also in the kitchen sink. I didnt think it would hold up to a bar of soap without tipping but it does the job..No more mushy soap..I love it. I set this soap dish on the corner of my bathtub. When you take a shower the water actually runs off so the soap is not sitting in standing water. Best soap dish I've ever had. This product does what it was designed to do--keep your soap dish from getting all mucky. The plastic is sturdy and durable, has a nice shape and feel to it, and is easy to clean. All my friends who see it want one for themselves. The only drawback is it may not sit level on your counter top IF your sink has a raised lip wider than the distance from the dish's base to where the spout starts curving down (about 1 inch). Even so, I have it sitting next to a sink with a rounded 1-1/2 inch wide lip, and the curved spout still fits nicely over it, although part of the base is lifted up about 1/8 of an inch. Still looks nice, still works great. Just something to be aware of. I love everything about this product except that it is just a hollow oval of plastic on the bottom. This means that if you have a normal sink with the little soap divets crafted into it, when you put this on there and put soap on it it just falls into the sink. I took a small suction cup with a hook on it and put it in the divet, then put the holder on top of it and that seems to keep it from falling. The manufacturers should just add an attatched suction cup to the bottom and add a dollar or something to cover the cost. I would have paid a dollar more for that, seeing I had to buy a package of suction cups at the dollar store anyway. I use this in my kitchen. It works just as it says and keeps my soap from slipping into the sink and also keeps it nice and dry. The dish would be much improved if it had a suction cup on the bottom or if it was heavier. When I use the soap the dish has a tendency to fall out of place. It is so light! Also, if there was a prettier version available I would use that for my bathroom. Despite these very minor complaints, I'm glad I bought this dish. I really like the product. I was tired of mushy sop in standard dishes. I love this product it fit perfect on my sink.Keep my soap dry.I put two rubber clips to hold them on the sink. i use it for my bathroom sink and find it helps keep the top part of the sink clean so i don't have to clean mushy soap off it. it's definitely sturdy but i wish it had a rubberized bottom so it would stay put cuz it can slide around alot. not a suction cup bottom cuz those only tend to stick for a while and then pop up. i might get some kind of small silicon mat to put under it to see fi that will keep it in place. This totally eliminates the messy soap dish that everyone complains about. The soap stays dry. A quick rinse a couple times a week is all this dish needs to keep a soap build up from forming on the prongs, bed and lip. Everyone who visits my home, and bathroom, wants to know where I got this great soap dish. i started making my own soap and this thing works great to make the bar last even longer. just wish that it had a suction cup bottom. I use it with big bars of homemade soap. I don't want to waste the soap, so this product helps the water drain nicely off of the soap so it does not go down the drain. The price is right. I'm ordering more of these! I bought one of these 10 years ago. I am buying more now with the decision to convert from liquid to bar soaps. What a simple but great idea this soapdish is! The only downsides are that it's plastic (would love ceramic) and only comes in white. Also I have guests that tend to push it up so it drains onto the top part of my sink instead of draining into the bowl. Allows soap to dry and not sit in suds and get gooey. It works well with draining soap so it doesn't sit in a pool of water and slime. That was the reason I was looking for this type of soap dish. The things I feel that could be improved is the material, the plastic is not very attractive for a bathroom. Also, the base of it slips does not fit with every sink. I can use it but if it had some sort of suction cup underneath it would be more functional. Given all this, I do still have them in every bathroom. I think it is a good idea I only wish it would come in something other than plastic, like glass!! I wish I had this last year! This works just as the book said it would. The Dish does not set as low on the sink as shown in the picture, and also slides around, other than that does keep soap HI and dry. I like a good useful, practical, quality products. It is not about being a budget, midrange or high end shopper. This product is useful and saves having to wipe up soap scum from counters. Does what it says but the base feels a little flimsy. I wish there was an optional solid piece construction. Other than that can't complain too much. I bought 2 (1 for each of our showers). Works great in 1, but my other shower has smaller shelves and doesn't fit. Be sure you have adequate room. Does what I wanted it for! This needs a very smooth surface for a rather large suction cup. It takes more space than it needs to, but it is very good at drying the soap and saving it! In 1978 a friend bought a small, simple shower soap holder for me from Drake. I still have it. Tried to find the same thing but this was the closest. This one works OK but I like the old one better. It serves the purpose I bought it for very well. Item would work a little better if it was 3/4" shorter. I am happy wiyh this product. One came broken but my Jack of all Trades fixed it. I have them both on the sink in the bathroom. Works very well. No more messy soap scum. The thing I don't like about it is that it is too wobbly on the base. Thr suction cup holds well enough but the dish swivels and wobbles all over the place. I don't like that. I am going to try to stableize it with a little super glue. Good luck to me! I believe there is room for improvement on this product so I am giving it 4 stars. all over the counter. and it is so economical. thanks. It does what it advertizes! We had soap dishes in the bathroom and by the kitchen sink which always collected water and made the soap mushy. This dish lets that water drain away, and it's still easy to grab the soap bar and put it back. Good product! It should tilt a little more. Picture does not match the product, yet I have an older one that does tilt more. It is a cool and functional soap dish regardless. Just wish you offered more color varities; otherwise, I love this item. I gave as gifts and everyone that I gave one to was very pleased and really liked it; stating it looks good in their bathroom and wants to know where I get it from and of course I gave them the information. Needs a suction cup or something to keep if from sliding around on the vanity. Better quality of material would be nice as well, even color selections. It meets my needs, keeps the soap drier. i like that you don"t have soap all over the side of the sink what I don't like is it's hard to get it to stick on the side of sink and stay there it constantly fall off a lot. Great product, the dishes are a little larger that I expected and the suction cup doesn't stick to the sinks or the bathtube like they should other than that they are great the water drain off the soap and there is no more gunky mess on the bar of soap when you go to ick it up like there was from the plain flat dishes. I ended up using it by the tub as it was too large to place on the sink. If only you could get it to stay put! This item needs something to help it adhere to the sink surface. It is so top heavy that it falls into sink repeatedly. I used one for the metal corner rack and it was successful in staying put because I could "hook" it onto the lip of the rack. As far as keeping the soap nice, it is super! I purchased this for the use in my tub - it works well but I would have liked an angular shape to fit better, more securly in the corner and against the wall. Also to have rubber feet on the bottom to prevent slipping from its position. I should have read the description more. It needs a suction cup on the bottom. I have a ledge in the shower I was putting one. The other one is ok on the sink. I should have read the description more carefully. Great idea, but needs a stronger suction cup. Though it drains most of the moisture, the bar of soap still gets mushy on the bottom and leaves residue on the dish. I wanted the items that DID NOT have the suction cups on the bottom. There's nothing "special" about it. I would be better if it could stick where it is placed. I have one from a few years ago and it tilts and works much better. I had purchased these before through MK and I loved them. The first batch I purchased needed assembly by placing the stand on the bottom of the dish and it attached with a plastic screw washer. Yes, it will mildew, but most things do if left wet. If you are cleaning your shower weekly, you should be ok. I liked these so much I ordered another batch, but sadly, they either changed the manufacturer or the manufacturer changed the design. It is not all one solid piece and you cannot adjust the swivel of the base which to me is important because it helps it fit in a variety of spaces. I had purchased it for the shower. It does not fit on the ledge of the inside wall ledge. I use it at the sink, and it gathers soap scum. There is no way to hold it in place once you put it in the shower or on the sink. It slips off.....it needs a rubber ring on the bottom to stop it from sliding. It did not have enough tilt to adequately drain the water back into sink. I have bought similar soap dishes from Miles Kimaball in the past that were excellent. The present soap dishes have too small a base on them and wobble when taking the soap out of the dish and putting it back in. The prior soap dishes were much more stable(because the base was much wider) without a suction cup on them. I am very disappointed in these. The soap dishes have a great concept in that the soap residue drips down to the shower floor - not on the shelf. The idea of this product is good. However, I feel if this is made with better quality material, the product would be much better. I ordered 2 soap dishes and 1 arrived broken. Also, the suction cups do not do a good job of sticking to a porcelain bathroom sink. I was very disappointed in this current product. I bought this soap dish a few years ago and it was a much better design. Had more of a tilt and was a bit heavier which kept it in place much better. I really liked the old design- worked very well. This current product slides all over and doesn't drain nearly as well. I would not recommend this to anyone till the manufacturer makes some changes. I bought two of these. The suction cup on the one in the bathroom never would hold to the porcelain sink. The suction cup on the kitchen stainless-steel sink held for about 5 months. Now both of them are all but non-functional; they just slide around when you try to put the soap in them and pour water all over everywhere. Put a better suction cup on them and they'd be great. They drain the water from the soap very well. Unfortunately, I'll probably have to throw them both away. I bought this for my children's bathroom to help drain out the water left on the soap dish after their showers. It is made of cheap plastic and slopes very little to let the water "drain". It would also work much better if it had some sort of suction cup on the bottom to help it stay in place. This sounds like just what I need in the bathroom, but have never received it, so cannot rate it. I suppose that is a "suction cup" on the bottom of the soap dish, but it did not work. So even if it was designed to drain off he water into the sink it did not because it would not stay firmly on the counter. My Dad used this in his bathroom and it was very useful but it didn't last very long. It had broken after a few week so I had to throw it out. The bottom was very flimsy. sorry I bought two of them! The concept is great, but in practice, it just doesn't work! Because the suction cup doesn't work, it fell into the sink every time we tried to use it. Our counter is granite, so is very smooth and I thought sure it would be perfect. It is not what I expected. The advertized picture on the catalog shows a different soap dish. Not even the smallest bar of soap fits in the soap dish. If I could get my money back I would be very thankful. The slant and drain helps keep soap from sitting in water and getting mushy. Soap lasts longer and the plastic takes away the worry of breaking a glass or ceramic holder. I have one for the bathtub and one for the sink. A friend admired them so I wanted to get her some too. I have some, and want more. They are great! To hopefully make the soap not messy. I bought one for my daughter and she likes it, so I am buying one for my husband. I make my own soap, so I always use bars. This should keep them from "melting". Have one currently. Works great. My sister-in-law saw it and asked where I got it so I'll surprise her. would be nice not to have to clean up soap slop! This keeps the soap dry . Wanted soap dish to stay still. Super. This will help the soap stay on the "chair" part of the shower, rather than sliding off onto the floor, becoming a slip hazard. It has all the features I want in a soap dish. Looks like just what we need in a stall shower. Environmental concern to save soap. Great item! I am purchasing this to replace one I gave to a friend who had been looking for something like this. I have one in the kitchen for the sponges and one in each shower. I've had them for several years and have held up well. The suction cup could be a little stronger, but it does work well. I only wish I could get a replacement suction cup since the original one is wearing out. My shower has no soap dish. I need some to drain off the water from my soap after I use it and this item looked very nice. Great item to keep you soap from getting mushy. Tired of having gooey soap. I have specialty soaps that cost a lot and when they sit in regular soap dish they get used up faster. Looking forward to being able to drain the hand soap and still keep it in the dish. Does the soap dish have a suction cup on the bottom to hold it in place? BEST ANSWER: Yes and it stays right in place; ours has been in place for about a year and never have had to mess with it. It drains the water off the soap bar very nicely! Yes, it does have a suction cup to hold it in place. I like this dish a lot. Will this dish fit on a Shower shelf? BEST ANSWER: Thank you for your question. It will depend on the size of the shelf. If it is big enough the dish will fit. We hope this information will be of help to you.